Custom Bandanas UK: Design a Stylish Personalised Bandana. Personalised bandanas are cool, stylish and fun, and can be styled in many ways. Design your own bandana made from Pima Cotton Lawn fabric, which is similar to Egyptian Cotton, and available in three size options. Bandana printing allows you to create your own unique style and stand out from the crowd. Handmade to order with a fine pin hem, they are an original accessory for all sorts of uses, from hairbands to dust masks. Custom bandana printing makes a great choice for a unique gift or as a fashionable treat for yourself. Upload a favourite photo, design or personalised with text and create a true style statement. Your personalised bandana is printed edge-to-edge in full-colour long-lasting print and finished with a beautiful pin hem. It comes in Pima Lawn cotton fabric. 30°c wash, low tumble dry, iron at low heat only. Product was outstanding. Very sharp & well made arrived quickly aswell. 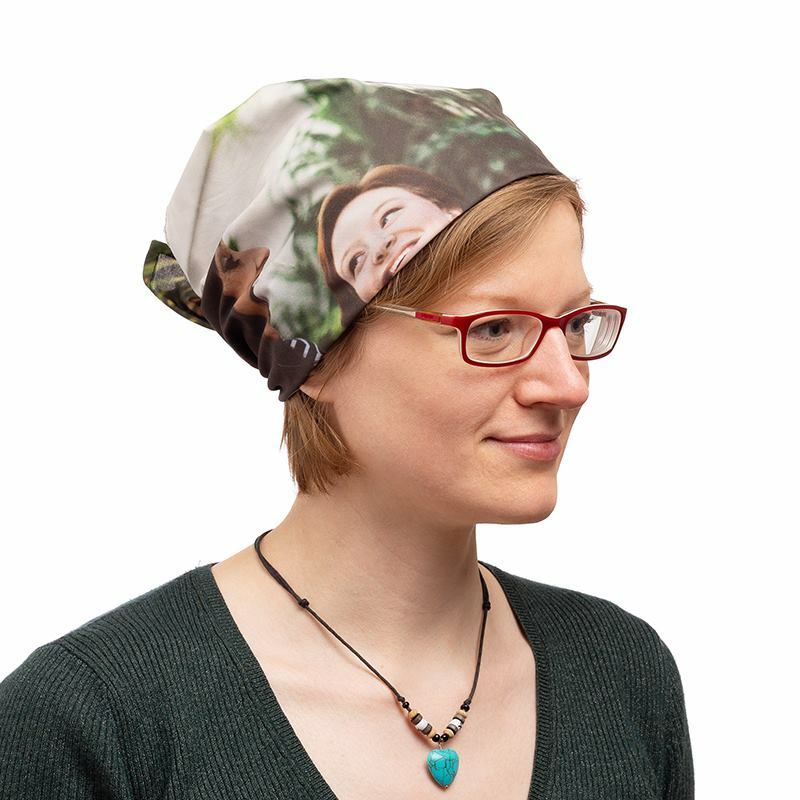 The bandanna is of high quality material, images have been reproduced perfectly onto the item. Very happy and would recommend this company. The graphic was so easy to import and has come out with really great clarity and quality. Custom UK Bandanas are lovingly handmade in our London studios by textile professionals. We print onto your fabric using a specialist process that fuses the ink deep into the fibres, ensuring your designs won't peel or scratch away. We hand cut the fabric and finish the edges with a fine pin hem, ensuring your personalised bandana doesn't fray. You have a choice of black or white top stitch thread, so choose the colour that will best complement your design and blend in. The bandana printing quality is supreme, allowing you to print fine details and bright colours with perfection. As we print edge-to-edge, a very small fraction of your design (approx 4mm) will be used to formulate the pin hem, however, this is indicated in the design interface when you can see the bleed area. For a fun holiday accessory, design your own personalised bandana and really get into the spirit of summer. Children can wear them to their kids' club, whilst parents can kick back on the sunbed and protect their heads from the sun. Choose photos from your previous holidays for a fun photo collage. You can also use your made-in-the-UK custom bandanas as a dust mask for safari trips or camel riding in the desert. Print an animal inspired design or a funky pattern so you stand out in your tour group. Only one side is printed, so you know which way your personalised bandana goes. If you're looking to go travelling, print an exotic design native of the country you're visiting. This could be Moroccan prints, Dreamtime iconography or even Egyptian hieroglyphics. Such an accessory could help you feel the culture and feel a part of the country whilst you're there, and you'll look super stylish.